Or come back to this after you’ve read through the matter below. Just as Shaw loved playing with the still camera, as both photographed and photographer, he seemed to love even more playing with the movie camera, but strictly as the subject of somebody else’s filming, which made him vulnerable, of course, to the abuse of editors who wanted to use his appearances for purposes contrary to Shaw’s purposes. If you wish to see Shaw mugging for the camera and playing at being amusing and outrageous, there are many film clips available online, not only on YouTube, but here are a few YouTube addresses that will give you a representative sample. He would have been better off if he had not done some of these, for they made excellent grist for the right-wing propaganda mill. “(Rare!) 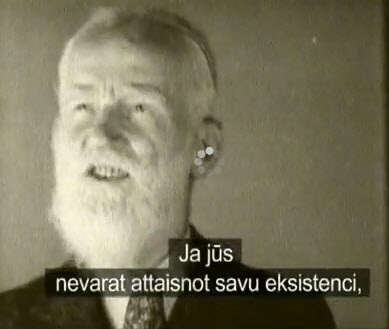 George Bernard Shaw's First Visit To America (1928 Fox Movietone Newsreel)” from transformingArt, but you can also find this in a slightly different version entitled “GBS at his home in 1928,” by the Balloon Guy , and the latter title I believe more likely. The film clip that’s second in the list is even more outrageously propagandistic, as you can tell simply by noting the melodramatic music in the background. Shaw is shown approving of exterminating “the unfit,” but of course, as even the film’s melodramatic narrator admits, Shaw’s idea of “the unfit” was quite different from Hitler’s and had nothing to do with Jews, gypsies, the malformed, or political enemies of the fascist state. “The unfit,” for Shaw, were the same “Members of the Idle Rich Class” that he had always castigated for consuming much more than they produced and that his character John Tanner had appealed to in “The Revolutionist’s Handbook” appended to Shaw’s play Man and Superman (1904) to justify their existence with more productive and more conscientious work for the public good. And Shaw had made it clear by his membership in the Fabian Society that his preferred way of “extermination” was through education (i.e., Fabian “permeation”), but Tanner’s handbook suggests it might have to be left to evolution if education didn’t work, and in that the Life Force was to be left alone to its own devices, forget eugenics. The “unfit” would select each other to mate with and their eventual sterility would cause them to lose out in the evolutionary struggle. The reference is to the historically factual way that many aristocratic and oligarchic families had vanished over the centuries due to class-conscious breeding practices that gradually weakened them. Shaw can be blamed for a rather naïve and unskillful attempt at times to use the newest form of news media for his own purposes, but he was simply being consistent with his lifetime habit of outraging the capitalist establishment with hyperbolic statements delivered either with a straight face or some jokingly pretend face, the purpose of which was to wake up the somnolent who through inaction were allowing mankind’s selfish, destructive, warlike impulses to rule the day. “(Rare!) 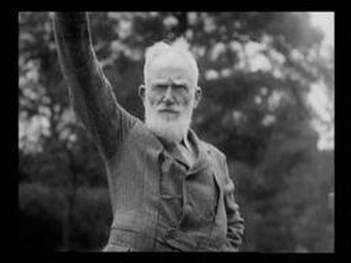 Various Scenes with George Bernard Shaw (1931 Fox Movietone Newsreel)” [Good example of Shaw’s playing with the movies]. And many more. Every one you open will show Shaw performing for the camera.